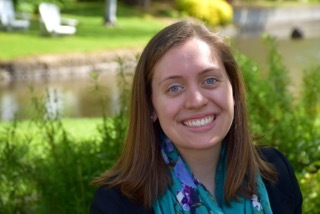 Kira Egelhofer has been selected as the next recipient of the Rosaria Haugland Graduate Research Fellowship. The Fellowship, established by Dr. Rosaria Haugland in 2004, is awarded every three years by the UO Department of Chemistry and Biochemistry to an outstanding graduate student in Chemistry. It covers the recipient’s stipend, tuition, and miscellaneous fees for a three-year period. Kira was selected from a pool of applicants by a faculty committee who were impressed by Kira’s science and her work to engage women and minorities in STEM. Kira grew up in Anchorage, Alaska, with a passion for nature and outdoor learning. In high school, a tough-but-inspiring female science teacher sparked Kira’s interest in chemistry, and led her to pursue an undergraduate degree in Chemistry at Willamette University in Salem, Oregon, with a thesis project in Environmental Chemistry. Kira entered the UO chemistry PhD program in 2015, and jump-started her studies in solar energy by taking masters courses the preceding summer that were offered by the UO masters internship program, and taught by Fuding Lin, Benjamin Alemán, Jim Hutchison, and Mark Lonergan. In addition to her research, Kira has been a member of the UO Women in Graduate Sciences since her first term at the UO. The goal of WGS is to involve and retain more women in the sciences. Kira enjoys the opportunity to promote science with K-12 students, young adults, and the wider community through a variety of WGS outreach activities. She currently serves as the organization’s Fundraising Chair, and is looking forward to their hosting a visit from Astronaut Wendy Lawrence for WGS’s annual fundraiser in March. As for what the future might hold after completing her doctoral degree, Kira has no firm plans, but a few possibilities appeal to her – such as writing for scientific journals with a focus on communicating science to the general public, or working in solar energy research and development, perhaps even for NASA or SpaceX.